I admit to having been in a pink mood lately. (My first granddaughter is due in August!) These grapes called out to be on a pink ground. I enjoyed the texture of the Canva-Paper, which makes it look like a little oil painting. Oh, and they were good, too! 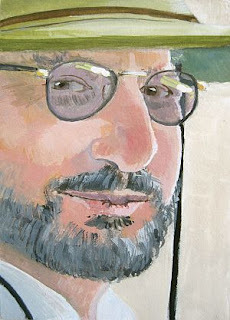 I borrowed this photo from WetCanvas, too, and have never met this man. The name on the file is Steven. I couldn't think of a title, so Steven it is! I painted it on Illustration Board, which lets the paint sit on top of the paper. It's a much different experience than painting on the softer papers like Arches or Pastelmat. Every stroke shows up! I really like the hat and lanyard and decided to leave it in place, boldly black, which seems to draw the eye to his face. I'm most pleased with the glasses and with his beard. I'm still learning! 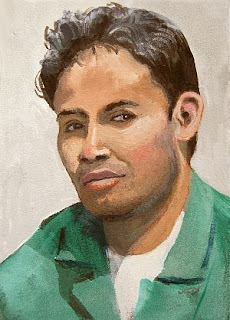 Another of my experimental portraits, this time trying a man's face. I painted it on black Pastelmat paper, which has given him a swarthy complexion that I think works pretty well. 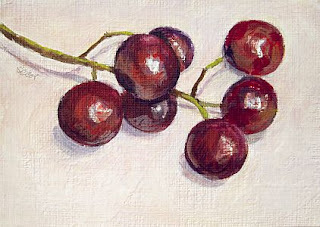 The photo is another one from the Reference Image Library at WetCanvas. I'm learning a lot! Home is where your heart is, they say. 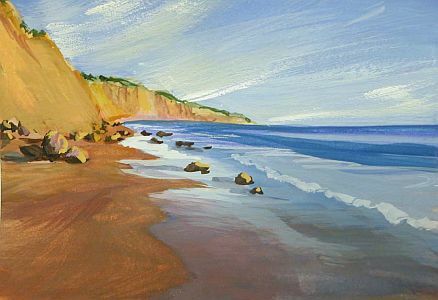 I grew up on the beaches in California and this painting just has that warm, windy, summer day feeling I enjoyed at the beach. It's 2.5" x 3.5" in size, as usual, and is gouache on Bristol Vellum paper. You have a week to bid on the paintings through DPW's in-house auction site, and 100% of the proceeds are promised to various charities going to Japan. I love it when we can all give in order to benefit a need! Hurrah to the DPW group for this challenge. To my artist friends, please also consider making a painting donation. The theme is "home" and can be any subject matter. But above all, please keep the Japanese people in PRAYER! This is from another shot from the WetCanvas RIL--such a pretty lady, isn't she? I'm learning how to handle the shaded areas without making mud, which isn't easy. I love that gouache allows me to completely wash off and begin again in places where its needed. Her right cheek (on our left side) has had multiple passes, as well as her left eye, which I relocated several times. 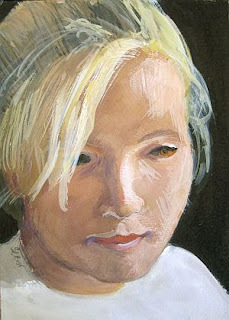 It's painted on white Pastelmat, giving it a softness that this face invited. Hope you like it! They aren't going to be for sale because I'll be referring back to the first few. 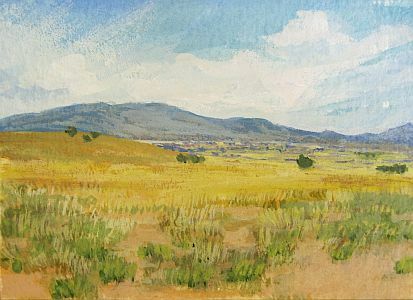 This one was painted from a photo from the Reference Image Library at WetCanvas. I'm not sure it looks that much like the girl, but that isn't my greatest concern. I want to use good contrast, capture a mood, and paint loosely, with painterly strokes and fresh colors. This one pleased me. And yes, it's the same size, 3.5" x 2.5", and is painted on Pastelmat. It's on a piece of Arches 300 lb. cold-press paper and is a view I've painted before, drawn from the spectacular scene I often see as I drive down the hill from my house. 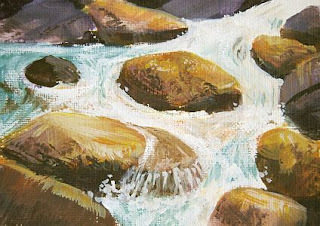 I always wish I had time to compete a painting at a demo, but it seems the excitement and distraction keeps me from doing that. I was delighted to paint and talk about gouache before this large, active group. 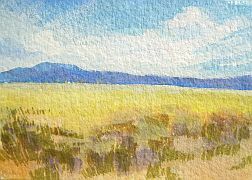 They're busy finalizing plans for the Western Federation of Watercolor Societies Show, which they are hosting this year in Albuquerque, May 6-June 5. I'm sure it will be an excellent show! I think Canva-Paper is fun to paint on. It makes them seem like miniature oil paintings. That texture really gives a strong impression. Is no one paying attention? 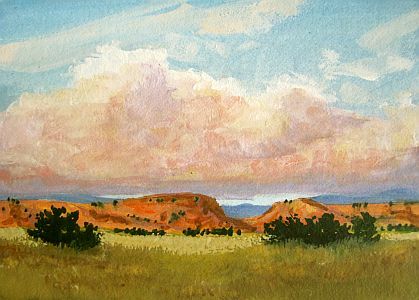 Soft pinkish clouds over golden mesas and yellow-green fields, with blue mountains in the distance--all true in New Mexico! Just to see if anyone is paying attention. 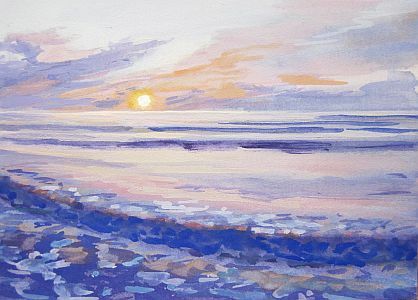 A sparkling calm sea as the sun descends--just the place I want to go right now. It's been nice visiting there as I painted it. I really wish I could tell you where I got this photograph, but it's not marked and it remains a mystery to me. Wherever it was, the person taking it was blessed! 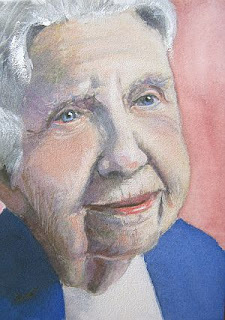 Thanks for sharing your beautiful moment and allowing me to paint it, too. 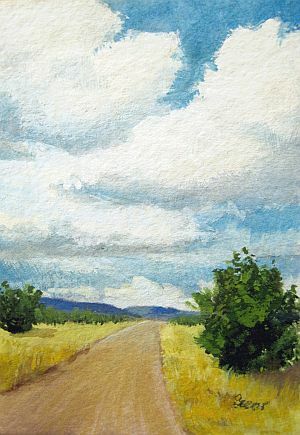 I'd like to take this dusty little road out to the mountains and do some more exploring and painting! Last month I went to a monthly craft gathering at our church and while there I played around painting this one. Sometimes when I talk and paint simultaneously I find my hands doing the work almost independently. I was on a "new road" with the gals there--a good one, I think. On Arches 300-lb cold press.